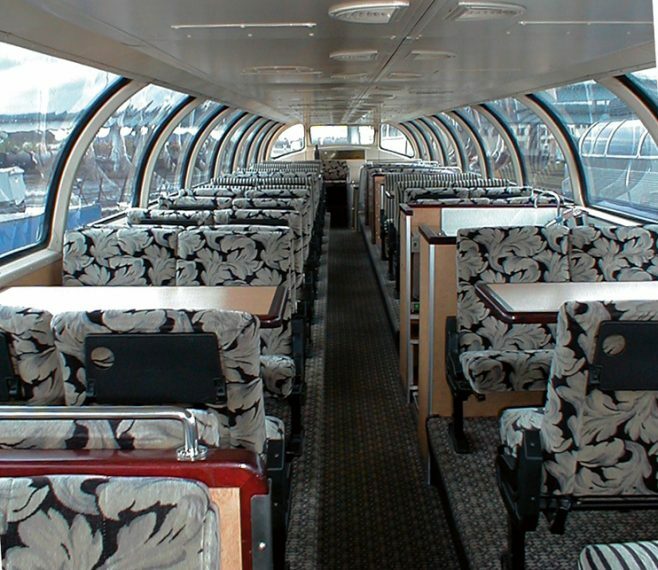 A full-length ex-Santa Fe “Big Dome” lounge car augmented with full galley and bar. Has coach reclining leg-rests and two washrooms. Seats 66 in the upper level and 22 at tables in the lower level and is based out of the Northwest. Broadcast Radio/CD Player/DVD. Built by Budd in 1954 as part of an order re-equipping the Santa Fe’s streamliner fleet. Ultimately sold to Holland America to operate on the Alaska Railroad from Anchorage to Denali and Fairbanks. Acquired in 2007 by Iowa Pacific along with eight other similar domes. This car is one of three identical domes in High Ironâ€™s fleet and can be chartered singly or as a group.